This unusual surname has been recorded for at least four centuries in it's "modern" spelling. 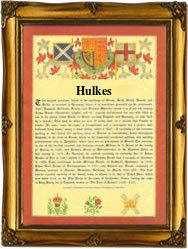 The spellings include Hulk, Hulke, Hulks and Hulkes, the latter two being patronymic forms "Son of Hulk". The origin however is much more obscure, it is believed to be a nickname for a person who literally "towed" ships and barges. It derives from the Medieval English "hulc" itself a developed form of the Anglo-Saxon "Helkein" - meaning "to tow". In the days of sail, ships were often towed by small boats rowed in teams or even pulled from the land up rivers and this is believed to be the origin of the surname. Examples of the recordings include Elizabeth Hulks, who married William Barrister at All Hallows Church, London Wall, on April 16th 1702, and James Hulkes who married Penny Day at St. Giles, London on December 29th 1798. The first recorded spelling of the family name is shown to be that of George Hulke, which was dated August 4th 1588, married Elizabeth Skytte at St. Martin, Pomeroy, London, during the reign of Queen Elizabeth 1, known as "Good Queen Bess", 1558 - 1603. Surnames became necessary when governments introduced personal taxation. In England this was known as Poll Tax. Throughout the centuries, surnames in every country have continued to "develop" often leading to astonishing variants of the original spelling.